Let me start by taking out a caveat on today’s piece: I am not responsible for whatever I’ve written today. The responsibility for today’s article falls squarely on my recalcitrant fingers, which have recently developed a mind of their own, doing things without my authorisation. And I don’t blame them, anyway. We live in times when it has now become commonplace for the tail to wag the dog. When the head of a government agency can query his supervising minister and get away with it. When a D-G can jump over his minister, call his bluff, and report straight to the President, and no feathers would be ruffled. If you still doubt me, you’ll do well to remind yourself that only a few days ago, some unauthorised police officers raided the Abuja home of elder statesman, E.K. Clark. And before we could find the appropriate medication to stop us from puking, after ingesting the half-baked lies the police served us in explanation of the ‘illegal duty’ to Chief Clark’s house, the EFCC also served us its own special delicacy: Its operatives too raided the offices of Standard Chartered Bank – in search of God knows what! I won’t say anything about the mental and physical siege on Governor Ayo Fayose of Ekiti State. Suddenly, a serving governor – with all his immunity – can’t travel out of the country, even with a whole month to the end of his tenure.Fayose’s offence, I suspect, is not that he stole money (for they all steal), but that he not only ran his mouth too much but was ‘foolish’ enough to lose an election. I know many people would say it was Eleka who contested the election, but no honest person out there is in doubt that it was Fayose who lost. Now, one can begin to understand why outgoing governors are desperate to pick, and impose, their successors. At least, they’d be sure that the corpses they poorly buried during their tenures would not be exhumed – at least, not the morning after they leave office. So, if we live in a country where the President says one thing and his minister, or aide, does the opposite, and the President doesn’t even remember what his initial directive was, I guess it’s understandable if I think of writing one thing and my fingers type a completely different thing – which is my predicament today. That is why, despite how hard I’ve tried not to get sucked into the re-election bid of Governor Akinwunmi Ambode of Lagos State and the maneuverings of the Mandate Movement in Lagos APC, my confusion persists. And no one has been kind enough to dispassionately explain it to me. Until now, I had naively thought that Ambode was doing well as a governor. But it would appear that the yardsticks we the masses use to measure the performance of our public officers are totally different from those used by party chieftains to whom both the elected and the electorate defer. How do I mean? Suddenly, the erstwhile poster boy, who was an instant hit with the Lagos suburbs – Tinubu and Fashola having done so much for the elite neighbourhoods – is suddenly being marketed as a colossal failure and arrogant and corrupt naivete. The roads we were all celebrating (especially, when he inaugurated about 23 of them in one fell swoop) are all now being dismissed as ‘China’ roads, that would soon be washed off in the next two years. And the ruling All Progressives Congress is just noticing this? It’s either APC was selling us lies all along or we were too blind to see, or too scared to say the truth all along. Whichever one it is, something just doesn’t seem to add up. But then, this is no ‘ranting of an ant.’ In fact, what is gathering momentum appears to be a storm of elephantine proportions. A tsunami. Eto and his governorship candidate. And, knowing that Baba Eto and Tinubu are like the proverbial apple and tree, which do not lie too far apart, many of us have put two and two together, to make twenty-two. The traffic robbers are back with a vengeance, smashing car windows in broad daylight. Sacked robbery groups are regrouping. The tankers and trailers that made Jonathan and PDP look so incompetent have become more daring. And the new narrative is that Ambode is not cooperating with the Ports Authority to fashion out a lasting solution to the menace. Hmm! 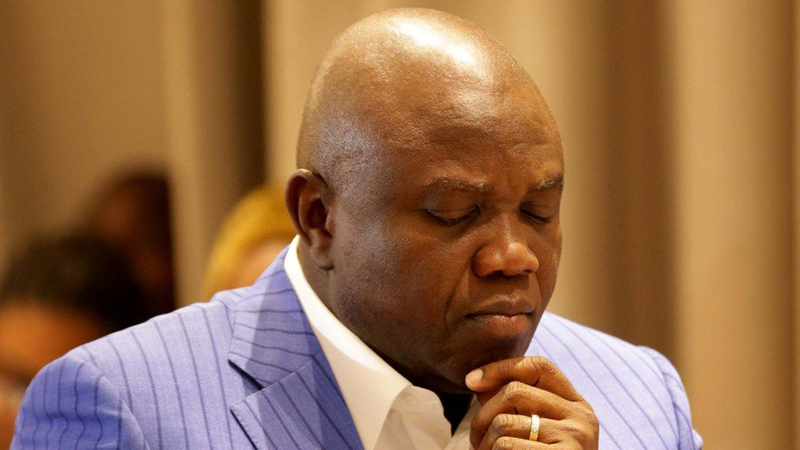 So, where did it all go wrong for Ambode, if indeed it has gone wrong? I must confess that I’m quite close to a few Lagos State government functionaries – and a few others who pull the strings from outside of government – but nobody is willing to categorically say what the problem is. Even though Ambode might not have scored a distinction in his first tenure, he still rates among the best performers in the current class of governors. – even without being told so. The result is that many of those who ordinarily live off government – directly or indirectly, legitimately or illegitimately – have been left high and dry. And starving. And frustrated. I got a firsthand experience of this frustration a few months back, when a certain roughneck called Bullet ordered refuse cart-pushers to be dumping their refuse right in front of a friend’s factory at the Amuwo Industrial Estate. The said plot of land, which he ceded to the cart-pushers (for a fee), was an undeveloped swamp that belonged neither to him nor his family. In fact, it was actually the end of a short street. And since the empty plot was waterlogged and practically inaccessible, the waste carriers simply dropped their loads on the road – right in front of my friend’s gate. They then set everything on fire, with the smoke billowing directly into the factory premises, and making it impossible for anybody to stay or work there. But that was not the whole story. After charging the cart-pushers for use of this new ‘dumpsite’, Bullet also threatened the factory owner with violence if he disrupted their activities, and also demanded an outlandish amount if my friend wanted them to stop. The roughnecks also frustrated the erection of a street gate by business owners on the short street, beating up the workers who had been contracted for the purpose, and confiscating their work tools. According to the roughnecks, their leader had to be paid N200,000 before the gate could be erected. Bullet’s grouse, wait for it, was not really with the factory, but with Ambode who had shut down all the dumpsites in the area with his Cleaner Lagos Initiative, forgetting that some of the local ‘lords’ made their living from the tolls paid by the cart-pushers. He even dared my friend to take the case wherever he liked, boasting that “Ambode would soon leave Alausa (seat of power of the Lagos State Government)” if he thought he could just be carrying on as he liked. Today, more than two months after that encounter, it would appear that the dumpsites, the mountains of waste and the politics of their collection constitute a major part of the many sins of Ambode. But whether the problem is from Osun or Lagos, I refuse to believe it’s over for Ambode, until I hear from Tinubu. For now, so many people who have heard absolutely nothing from the Asiwaju have since thrown their hats into the ring, punching away on behalf of the Jagaban. Ambode is suddenly turning into an orphan. Suddenly, competence is not nearly enough. Now it is becoming increasingly difficult for him to return. And if he must, he must agree to cede nearly all his powers and become a figurehead. I have deliberately refused to join the Alpha Beta imbroglio. But I dare say that Ambode’s case is fast looking like that classical Igbo analogy of the child who, without first fortifying himself, goes after his father’s killers. He ultimately gets killed by the same thing that killed his father. It would appear he asserted his independence too early. Meanwhile, who still remembers that, until Asiwaju had his final say, Ambode was not even the front runner for the Lagos governorship in 2015? Well, Asiwaju has yet to make that final pronouncement, so Ambode is still in with a chance. And a prayer. My only consolation is that whether it is Ambode or not, whoever the mantle falls upon to run the affairs of Lagos in 2019 is likely to come from the tested and trusted Tinubu school of leadership. Is Buhari really president of all and for no one?